You'll be the talk of the range when you waltz in with a 600-round ammo can of 5.56x45 "Penetrator" ammo by Federal American Eagle. Federal came by this highly sought-after cartridge via their contract with Lake City. This ammunition was manufactured in the state-of-the-art Lake City Army Ammunition plant alongside other mil-spec cartridges. 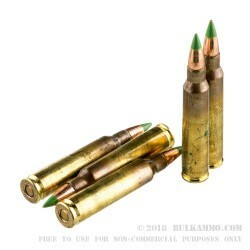 The painted green tip of the 62gr full metal jacket (FMJ) XM855 projectile is instantly recognizable for shooters who enjoy shooting this powerful ammo with their AR-15 rifles. The FMJ bullet is designed to keep its shape and pound the target with stunning force. Shooters typically experience a muzzle velocity at around 3020 fps and 1256 ft/lbs of corresponding muzzle energy. 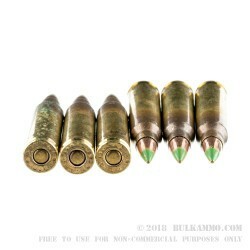 These cartridges have Boxer-primed brass casings that are non-corrosive and great for reloading. Together, Lake City and Federal premium have created a brilliant military-grade range cartridge for shooters looking to take their training to the next level. 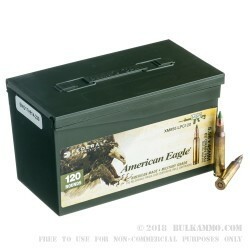 This 5.56 NATO ammo comes in a 600-round reusable plastic ammo can. 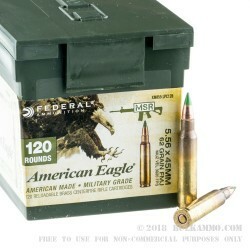 A: Hello Rick, This Federal ammunition is loaded with an SS109 style steel cored projectile. Q: velocity and chamber pressure? A: Hello Eric, Federal lists the muzzle velocity of this round at 3020 fps with a muzzle energy of 1255 ft. lbs.